This one was a quicky. Nice and simple. It took me five minutes to do it. Well, the thinking took another five minutes. There is glitter on the flowers but you can't see it in the picture. The Happy word was stamped, then punch out with a large oval punch. There was no larger oval so I mounted it onto a regal rose cardstock, then cut around it. I wish there made a larger oval punch. More baby cards! 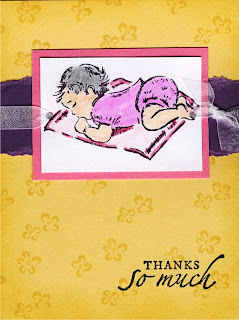 Here is another card I have made for a baby shower. Lots of people I know are having babies so I have to make lots and lots of baby cards. You can't see it but the flowers on the background were embossed with clear embossing powder. The baby was coloured using pastels. I made this card the same as the Mother's Day card. Just changed the sentiment. A lady at church asked me to make her some Mother's Day cards and I loved how it turn out so I made some for myself but put Birthday Wishes instead. No ribbon and no eyelet. The two yellow dots on the window punch pieces are just little dots that are punched out using 1/4" punch and glued on. For anyone who doesn't have any eyelets or the right colour that will match. Check back often to see more card ideas. The flower in this card was stamped and cut out of a seperate piece of paper then mounted on the card. This made it stand out a little. 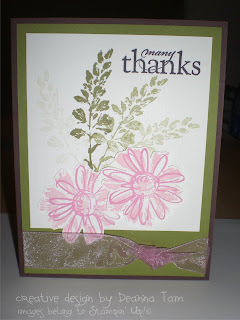 Next time I'll try the stampin' dimensionals to mount the flowers so it will not look so flat. You like the watermark on the photo? It is so neat. My husband did this for me. He is so talented. 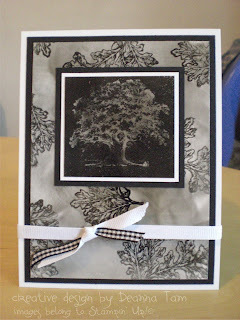 This oak tree card was from the set Lovely As A Tree. I did a soot technique to make this card. It is a fun technique to do but kind of scary if you're not careful. Playing with fire is always dangerous. Always have a tub of water handy when doing this technique. 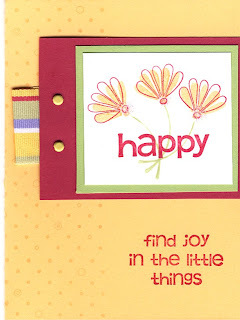 You can find the tutorial on Splitcoaststampers. It is a great site to go to for inspirations and techniques. I finally put some cards together. These were half completed cards from long ago. Now they are finished. I regret not buying the Terrific Tulips stamp set. It was retired last year. It was once on my wish list. It was a very nice set. 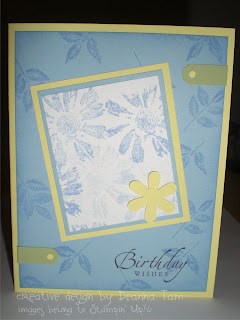 For this card I used Pretty In Pink cardstock for the card base and stamped On the Spot onto the White Whisper cardstock. I adhered a pink grossgrain ribbon through the centre of the card. 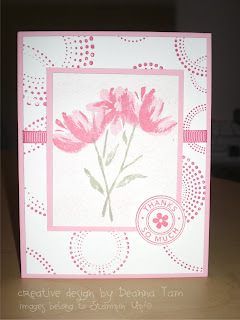 Next, I used the two step stamping technique on the tulips onto the Whisper White cardstock and taped it to the Pretty In Pink cardstock . I just got this Riveting hostess set and had to use it. I cut the circle freehand. 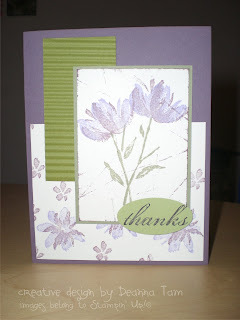 I used Perfect Plum cardstock as the base for this card. As you can see there are also three different green cardstocks, Old Olive (the crimped one), Mellow Moss and Certainly Celery. I used the direct to paper technique on the stamped image of the tulips. Now it is not so blah. I then randomly stamped the little flowers onto the Whisper White cardstock to make a background paper and adhered this to the Perfect Plum cardstock. I stamped the "thanks" from the All Year Cheer(I) set onto a scrap piece of Certainly Celery cardstock and punched it out with the large oval punch. Put it all together and voila! I made this card to thank all the ladies at church who gave my youngest daughter gifts for her shower. It took me a month to make 30 of this card. A lot of time, but well worth it! I used Whisper White, So Saffron, Perfect Plum, and Regal Rose cardstock. I coloured the baby with pastels. The Thanks So Much sentiment is embossed but you can't see it in the scan. I like the Welcome, Little One set and too bad it is retired. Yippee! The Starter Kit, It's Here! Yippee! My mini starter kit is here. Now I'll go and mount my two stamp sets Polka Dots & Paisly and Greetings Galore. I love the Polka Dots & paisly set. I received a card from my upline using this set. It is so beautiful. 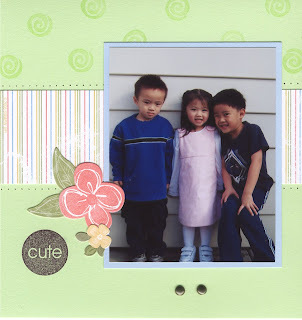 Two Saturdays ago my sisters and I did scrapbooking. We get together once a month to have a little fun and do what we love to do. The base is certainly celery card stock and the stripe paper is from the simply scrapin Delight in Life Sellabration kit. The word cute is from the SAB set So Very stamp set. The swirly is from the Fresh Flower stamp set. Oh my! My first post, ever! Everyone is doin' it. I just want to be part of all the fun." So here I go with blogging.